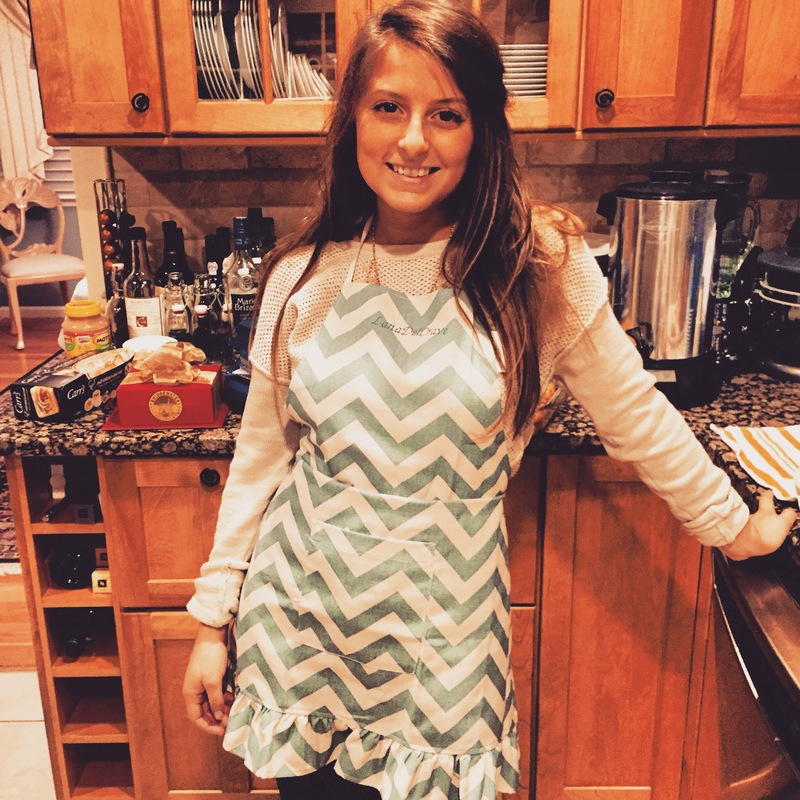 Growing up, my dad’s kitchen responsibilities have been scarce but crucial. He is on-call for grocery store trips to pick-up ingredients my mom and I may need for last minute recipes. He’s also responsible for taste testing – especially broken cookies he’d ‘secretly’ break while my mom and I had our backs turned. And finally, for executing the few dishes he’s mastered including the best Caesar salad, anything grilled, and these dill pickles. Buy small, very firm Kirby cucumbers. Kirby cucumbers are small unwaxed cucumbers – waxing would interfere with the pickling process. They are firm and crisp, as their seed cavity is small and undeveloped, which also means fewer seeds. Because the end goal is crunchy pickles the initial texture of the Kirby is crucial, so try to choose the firmest ones. Kirby cucumbers can be found at the grocery store near the other cucumbers. Adjust for jar size. This recipe was created in a VERY large jar (courtesy of my dad who purchased mine at The Container Store). If your jar isn’t as massive as the one I use, use the same measurements in the recipe but with multiple jars. As long as the Kirby cucumbers are packed tightly per jar and the other ingredients are evenly distributed, the pickles will be perfect. Storage is important. While the pickles ferment, it’s important to leave the lid off. 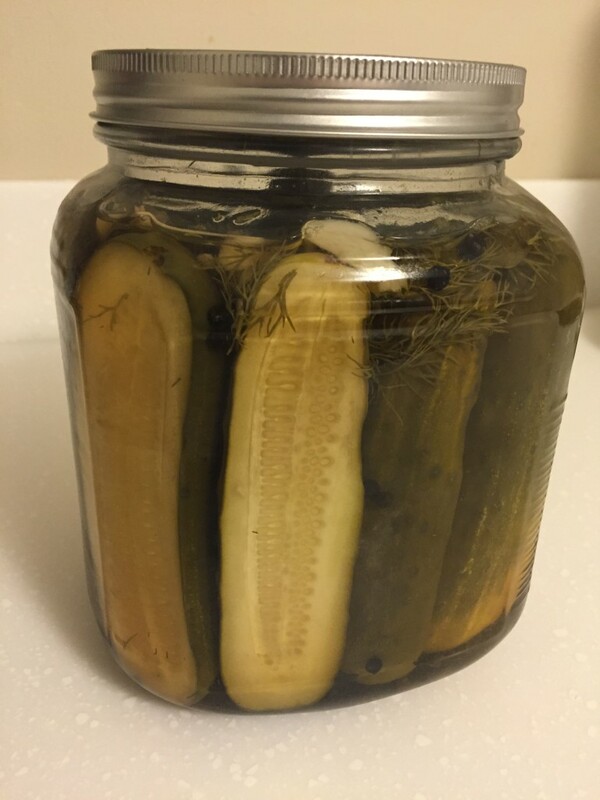 Should you seal the jar, carbon dioxide (a natural byproduct of fermentation) will build up and create pressure that could cause leaks or a pickle explosion once you open the lid. I like to cover the top of my pickle jar with tin foil or a dish towel to keep out dust, flies, etc. 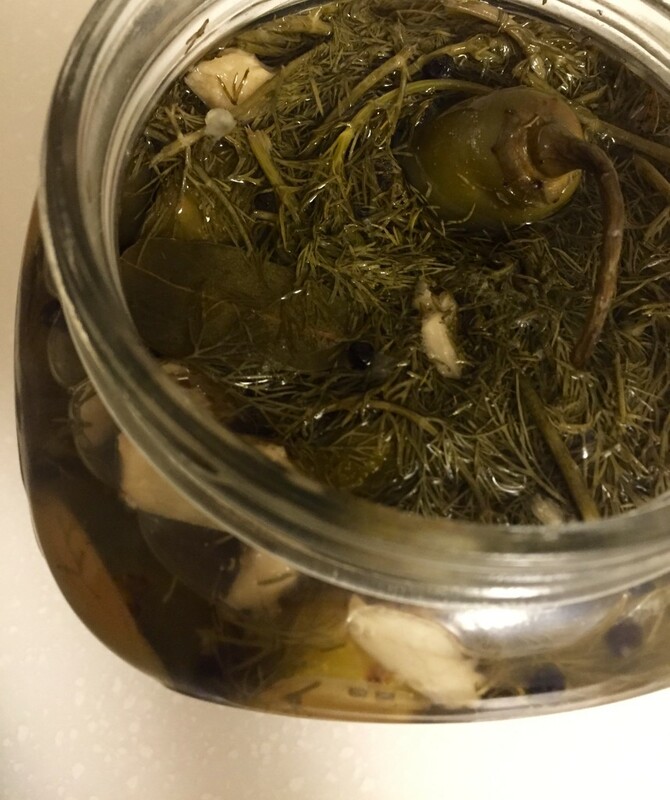 Also during the fermentation process, these salt-brine pickles should stay at room temperature in a dark place – like a cabinet. The garlic may turn green or blue and that’s okay. When my dad passed this recipe on to me, he gave me a heads-up that my garlic may turn a greenish-blue or aqua green color during the fermentation process. I decided to research why this happened – this curiosity comes with being a food nerd – and found that “some of the sulfur compounds characteristic of the onion-garlic family encourage the formation of molecules very similar to chlorophyll, the pigment that makes leaves green” (Harold McGee). It turns out, pickling is VERY scientific. Jalapenos are optional but recommended. I like a spicy kick to my pickles, so I add 2 fresh jalapenos. If you’re looking for a more classic, non-spicy pickle, it’s perfectly okay to skip this step. Bring 2-4 cups of water to a boil, either in a teapot or large pot. While the water is boiling, slice the Kirby cucumbers in half lengthwise - this is preference, my dad keeps his whole. If using jalapenos, make a slice down the middle (this will allow more heat to come through). Pour in the white vinegar, then fill the remaining jar space with boiling water, ensuring the Kirby cucumbers are totally covered. Loosely cover the jar with tin foil or a dish towel and store in a dark place for 12-14 days during the fermentation process. 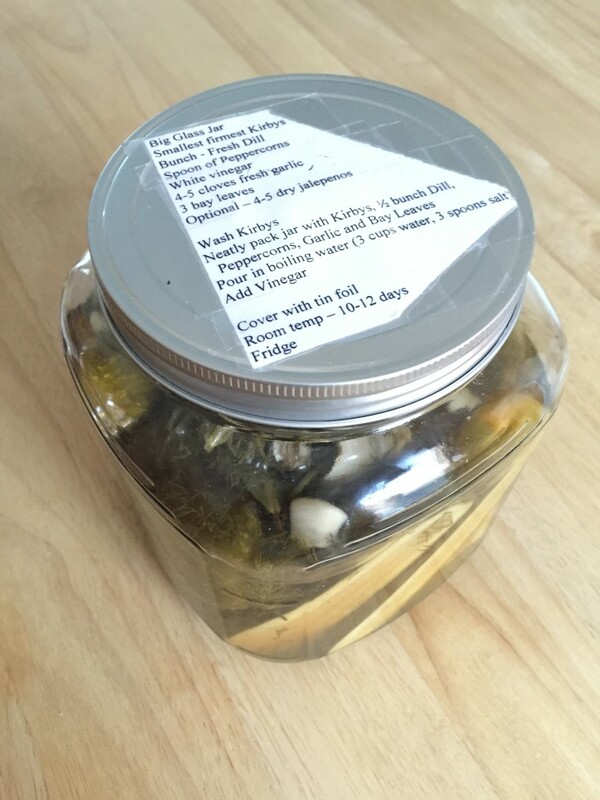 After 12-14 days, close the jar with the lid and store in the fridge. Once the pickles are cold they are ready to enjoy (see notes). 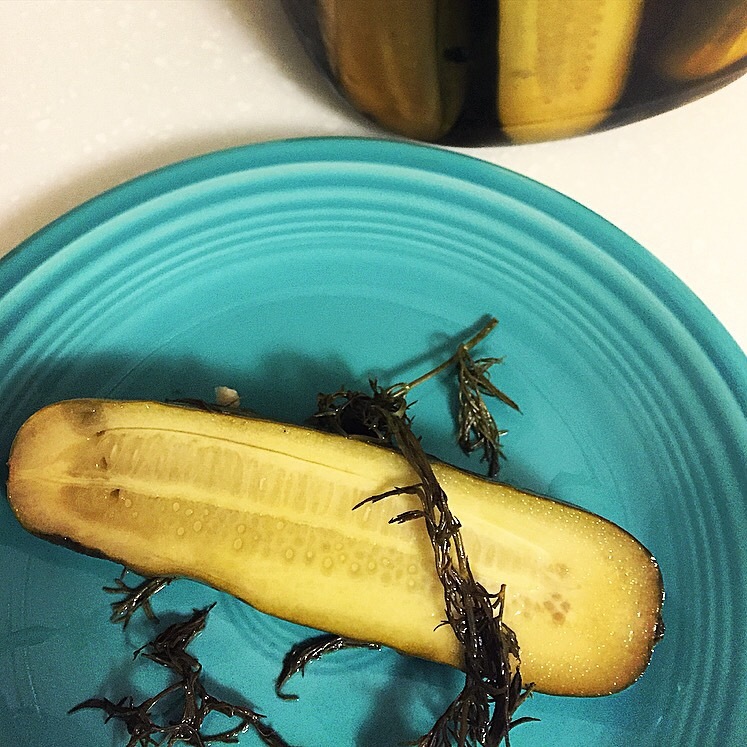 I like to chill my pickles for at least 24 hours before eating, but as long as they're cold they will be delicious!